Presenters are requested to stand at their boards during the morning coffee break, and lunch break, for informal discussions. The organizers are not responsible for posters not removed on time. Poster boards are portrait style. Poster size is 90cm (width) x 120cm (height). Please prepare your poster on one sheet of paper. 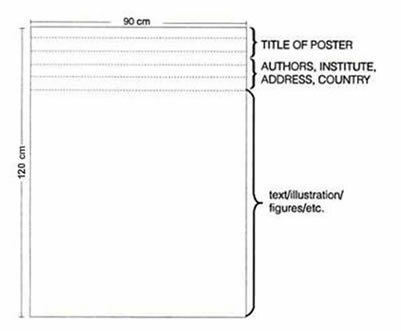 Alternatively presenters may display their material on several smaller sheets. Please note: we dont offer printing facility prior or during the Conference, so make sure you bring your poster to the Conference. Please refer to the Poster Help Desk in the Exhibition Area for the poster number assigned to you.